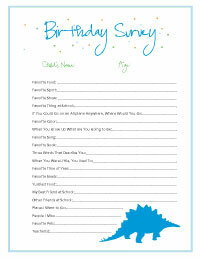 Home » Kids Birthday Survey and FREE Printable! Kids Birthday Survey and FREE Printable! I started this tradition with my daughter last year on her birthday where I have a list of questions that I ask her and the answers are usually typical but some very surprising. I love having this to put in her eventual scrapbook, to show her what she liked and was interested in each year. This past week I sat down with her to do the survey once again as I plan her birthday. Here are my daughter’s answers – scroll down for the FREE printables in both boy birthday and girl birthday! 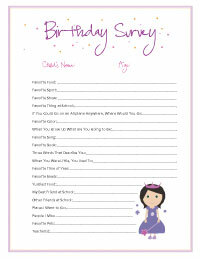 Click on the photo links below to download your free printable birthday surveys! These printables are pdf files for your personal use. Oh this is awesome!!! I never know what to do for the boys birthday parties cause what they want changes from day to day and you can’t serve crab legs at a kids birthday party. Well you can but I can’t afford that!!! Yes, my boys ask for crab legs for their birthday 🙂 At least I know know in general what kids this age like – will you have more of these for other ages? Very very cute idea! Thanks fro sharing! Pinned it! Have a fantastic weekend!